Reverse Confetti's August Sketch For You To Try is winding down. 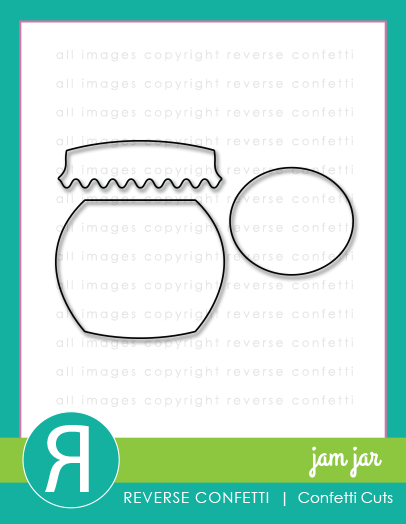 If you haven't yet played along, we'd love to see your take on the sketch! The deadline to enter is noon CST August 29. 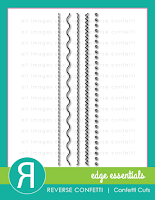 Until a few days ago, I hadn't purchased any new patterned paper pads in months. I was feeling very overdue, so I ordered a few, and tucked into Life is Beautiful by Fancy Pants for today's card. 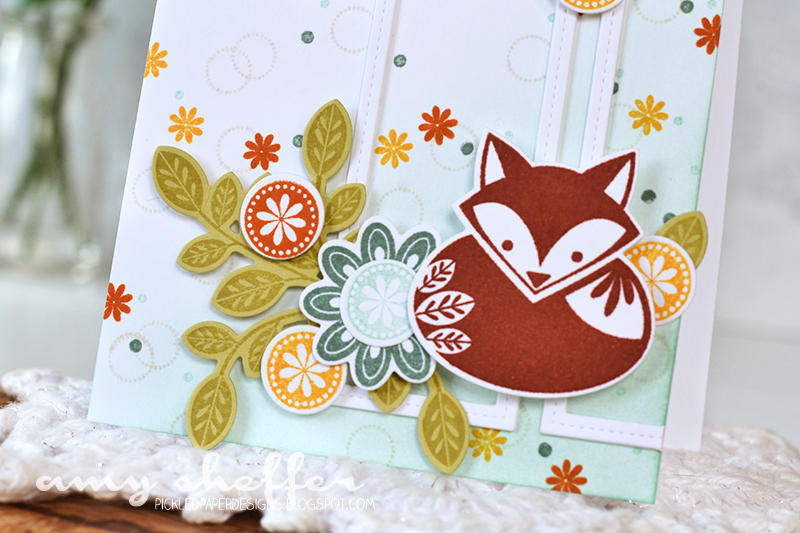 It was nice just to put some pretty papers together according to the sketch, and just let that patterned paper magic do its thing. 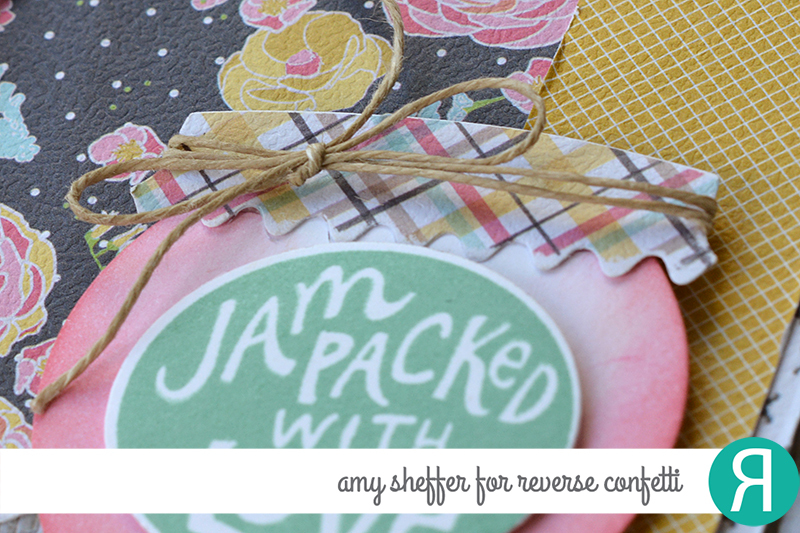 With the plaids and florals and gingham and woodgrain in this particular collection, I thought Reverse Confetti's new In A Jam stamp set and Jam Jar Confetti Cuts would be perfect. I just love the whole homespun feel! Before long, I found myself sanding and distressing the heck out of everything. It's been so long since I distressed something that I actually forgot where my distressing tool was. I was on the hunt, digging through drawers and tool caddies and cabinets, and all the while it was hanging on the same hook above the desk that it's been on for years! ... although it does get a bit lost in the whole distressing madness. 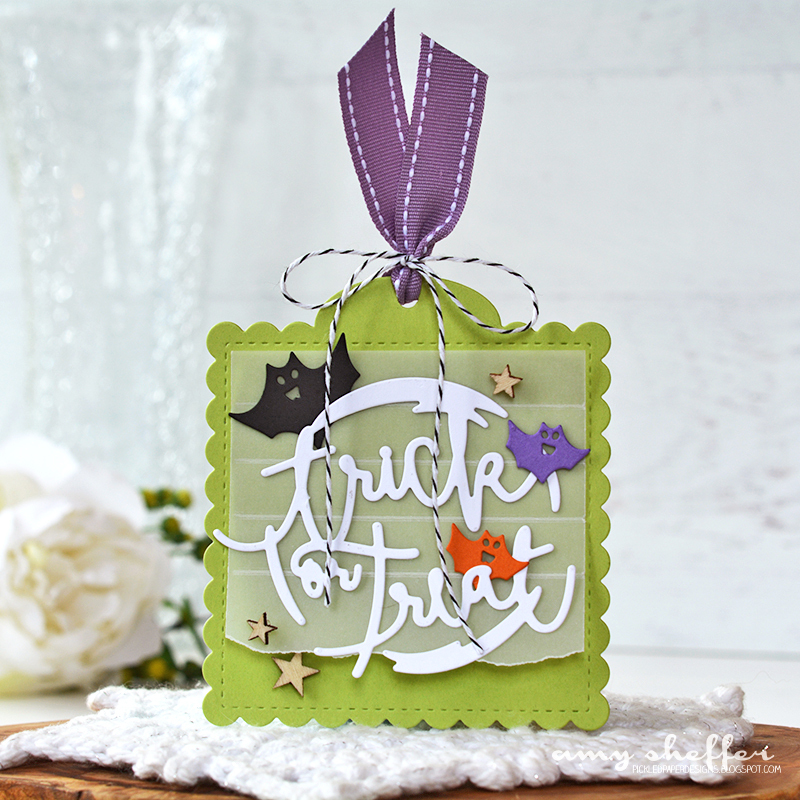 It was so fun to re-visit old favorite techniques for today's card! Thanks so much for visiting! 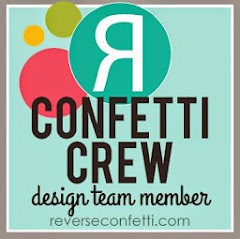 For more sketch inspiration, visit the Reverse Confetti blog. It feels like a month since I last blogged! It's really only been a week, but such a busy one. This is our last week before school starts, so you know how it is, trying to prepare for school and pack in some last-minute fun, too! Plus, the boy who first made me a mama turns 16 tomorrow. I just don't even have words for that! 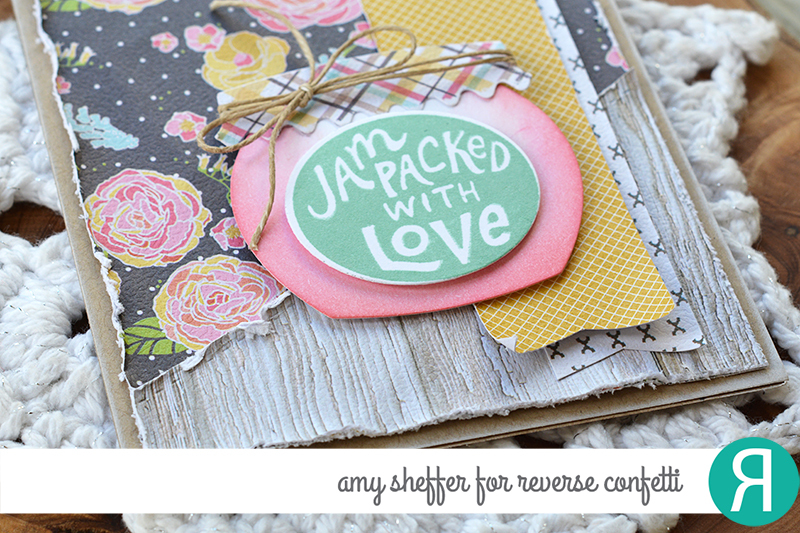 I'm over on the Reverse Confetti blog today with a cute little number for this week's Wednesday in the Works feature. I've been saving today's card since before the August release, so I'm super excited to finally share it. Hope you'll pop over there and join me! One of my children's babysitters from when they were little has recently become a mother herself. 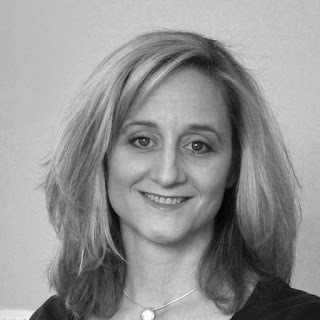 She was an amazing babysitter, vivacious and joy-filled always, and I know she's going to be such a fabulous mama! Today's card is for this beautiful baby girl and her proud parents. 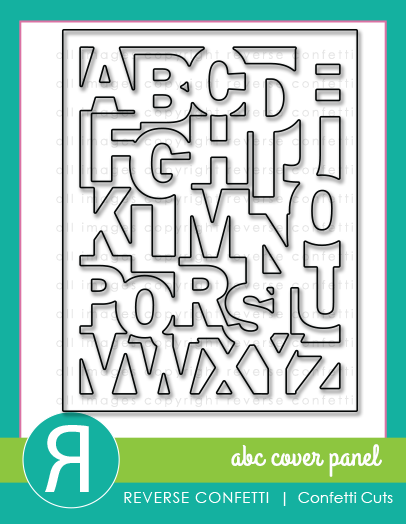 I used the new ABC Cover Panel Confetti Cuts die with an embossing sandwich to dry emboss the alphabet pattern onto white card stock. 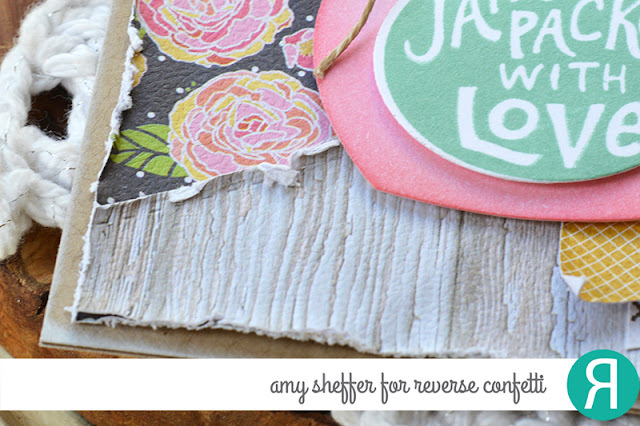 I love this die, both for die-cut layers and for dry embossing! 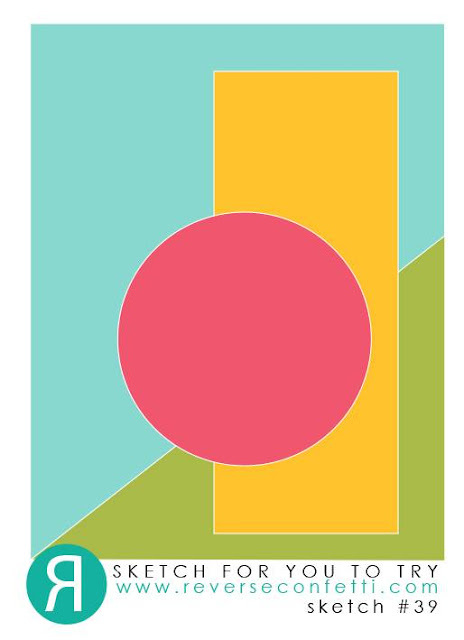 Next, I layered different circle elements in yellows, pinks, peach, and lime green. 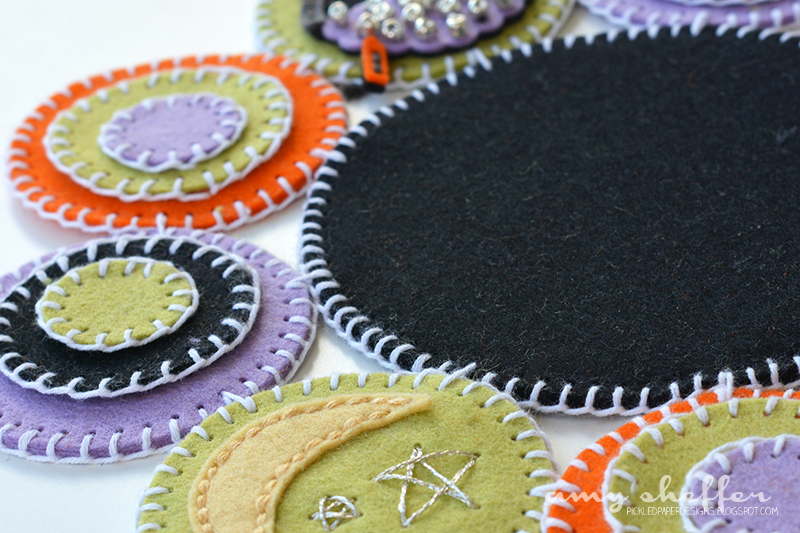 The circles were die-cut with Swirlies and Detailed Circles. The sentiment is white embossed over some yellow and peach ink blending. 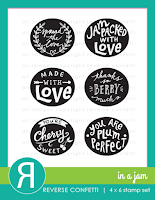 Last, I stamped a onesie using one of the Cute As A Button images, die-cut it with the Onesie die, topped it with a white stamped heart and tiny yellow button, and popped it up onto my layered circles. It's Release Day at Papertrey Ink! All of the new goodies we've been sharing the past few days will be available tonight at 10pm ET. Do you have your wish list all ready to go? 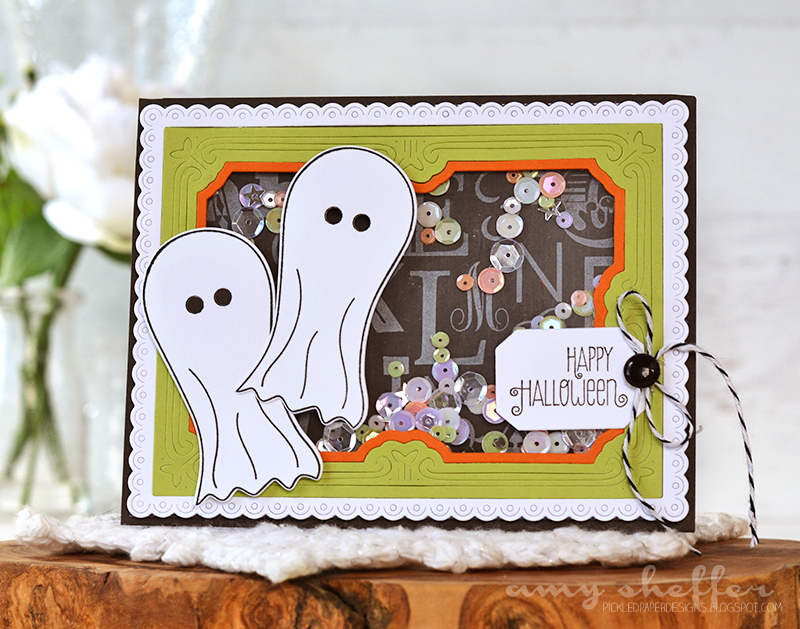 First up is a cute Halloween card that I made with Betsy Veldman's Dress Up Dolls: Halloween. I adore both the ghost and pumpkin costumes as well as the trick-or-treating extras. 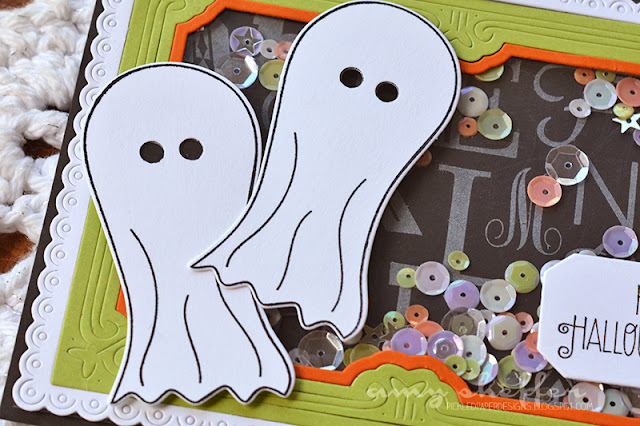 For today's card, I've used just the ghost costume by itself, no doll underneath, no feet or accessories or anything. I wanted the ghosts to have a floating look. 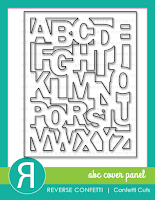 The background of my shaker window is stamped with Lexi Daly's Alphabet Soup (love this!). The frame pieces are all from the previously released Cover Plate: Pretty Frame die. I'm so excited Kay Miller is bringing her talent and style to product design for Papertrey! 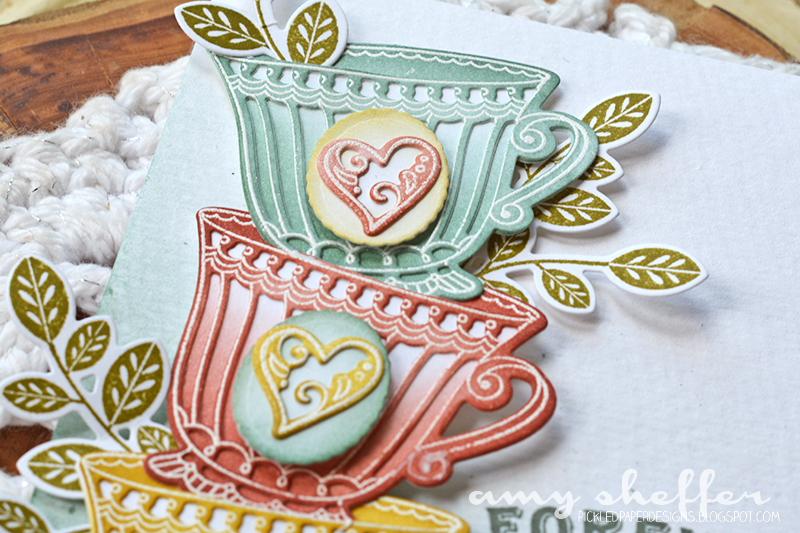 Her first two stamp sets are fabulous! 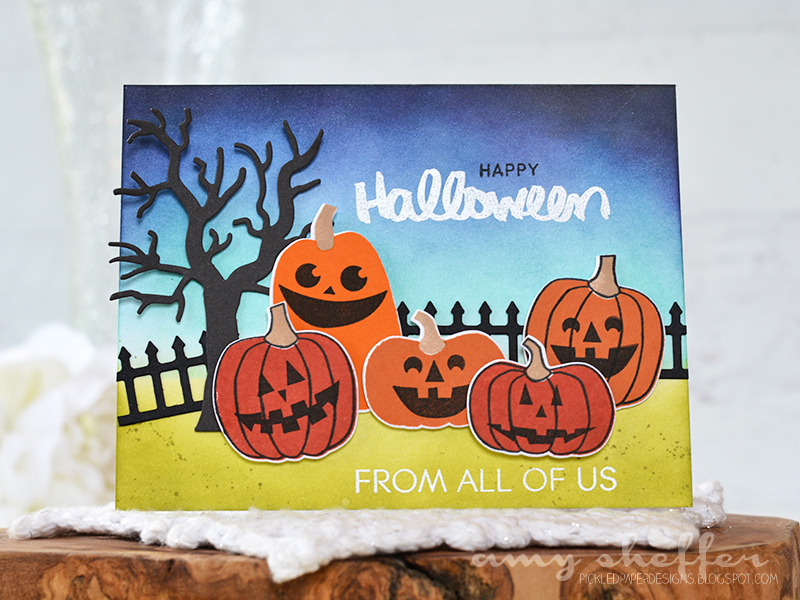 I made this card with Spooky Smiles. 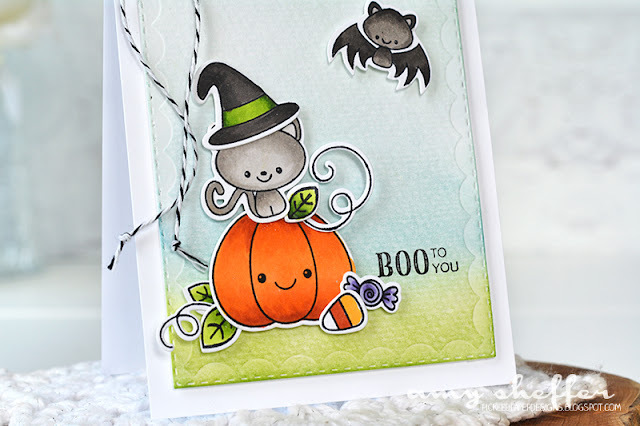 How cute are these images? I cut a panel of watercolor paper with the largest of the Double Ups: Rectangles dies and did some ink blending to set the scene. All of the stamped images are colored with Copics. So sweet! Kay's other set is Stylized Autumn. I love the clean, graphic look of the florals and leaves. And that fox?! So cute! 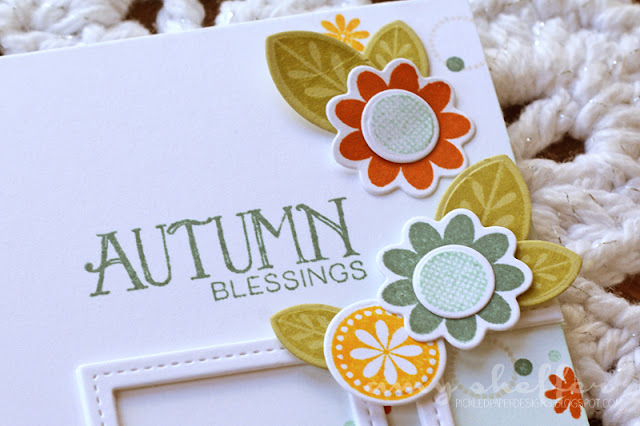 I inked blended the bottom right corner in Aqua Mist, then did some stamping over that. 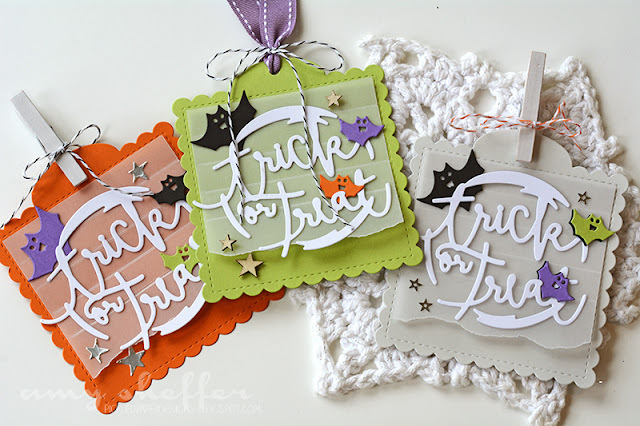 The two vertical white frames were cut with one of the Keep It Simple Frames dies. Then I began adding all the stamped die-cuts (leaves, flowers, and the sweet fox). 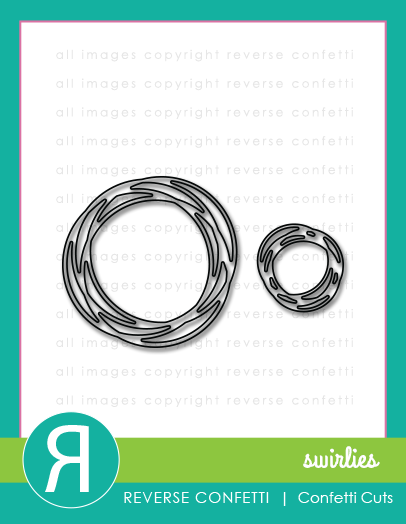 This next card is a little more funky and modern than my norm! Alphabet Soup by Lexi Daly is in the background. 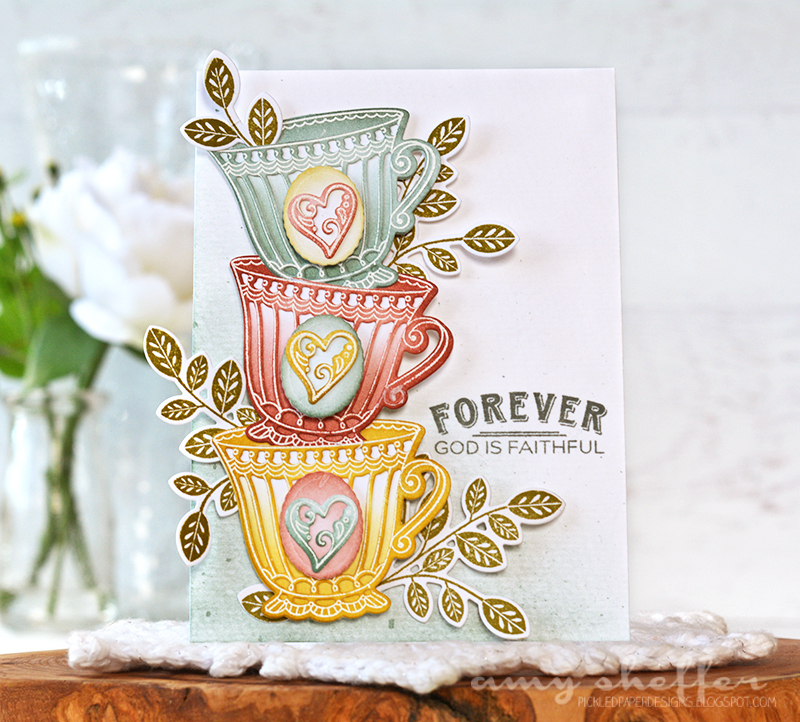 The sentiment and leaves are all from Maile Belle's Fancy Foliage and Fancy Foliage Details. I love these leaves SO much. I'm just going to tell you right now, expect to see these often! 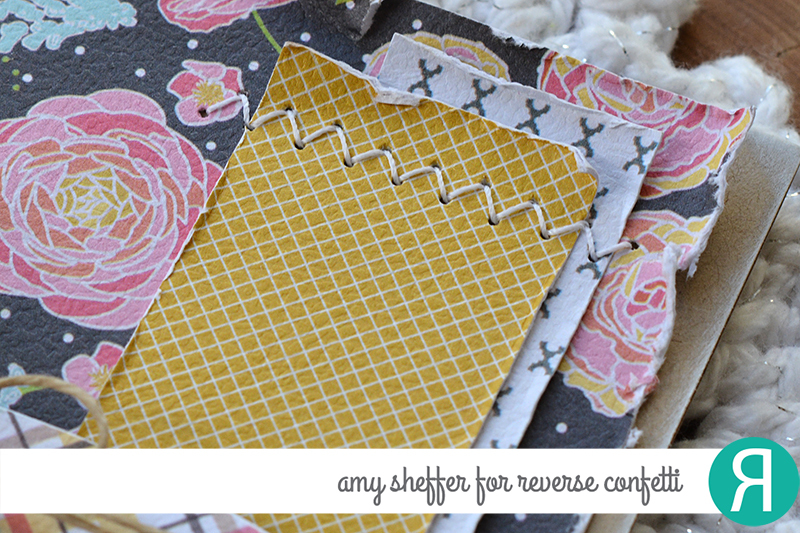 The Luxe Gold Adhesive sheet leaves add so much to this card design, but unfortunately don't photograph so well. 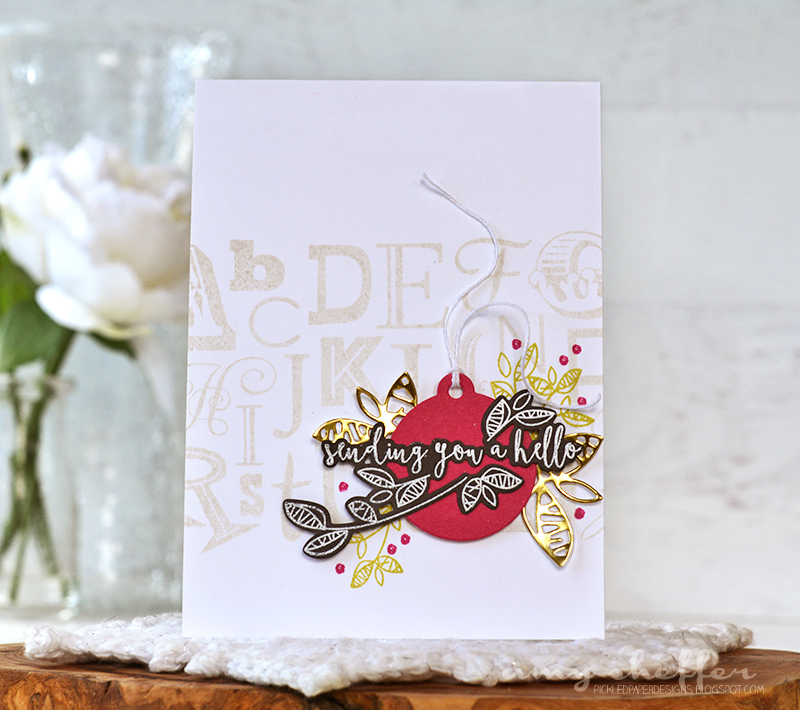 In real life, there's a nice contrast between the gold foil and the Limeade Ice stamped leaves behind. I'm thinking teen girl for a recipient. What do you think? 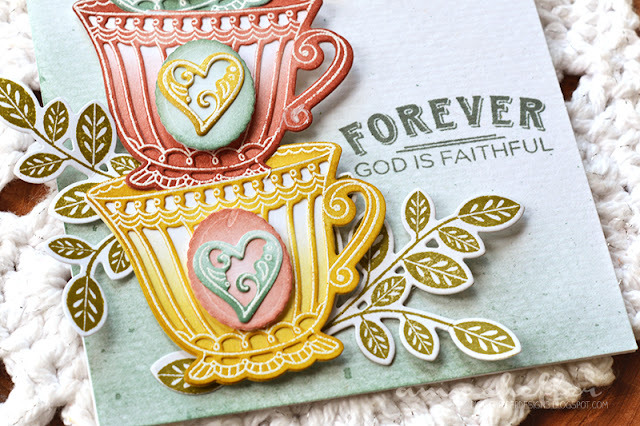 These pretty teacups are from Betsy Veldman's What the Doodle: Tea Time and this sentiment is from Dawn McVey's New Every Morning. 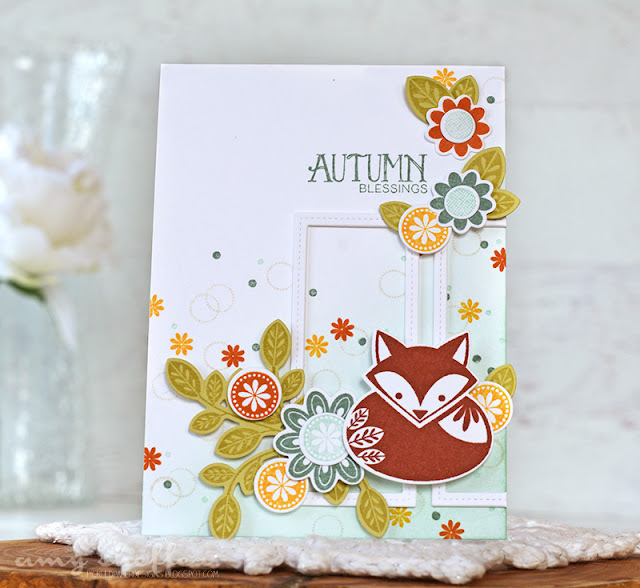 I white embossed the detail image on the detail die-cut and then did some ink blending in warm fall colors -- Ocean Tides, Americana, and Saffron Spice. The leaves are from Stylized Autumn. 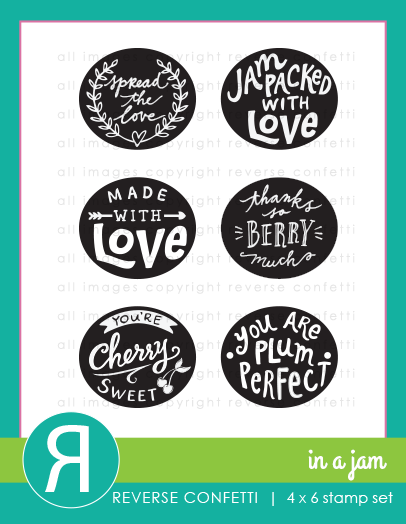 All of the new products will be available at 10 pm ET on August 15 in the Papertrey Ink store. 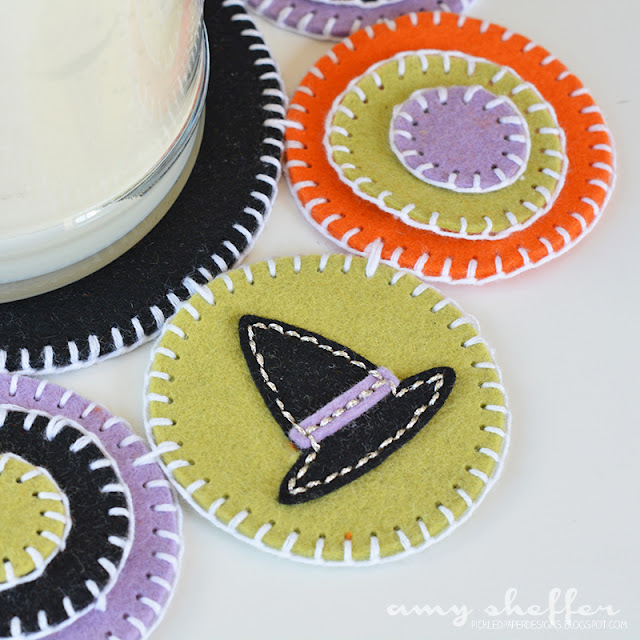 I've been wanting to make a penny rug mat for a while now, and these new Halloween dies were the perfect motivation! 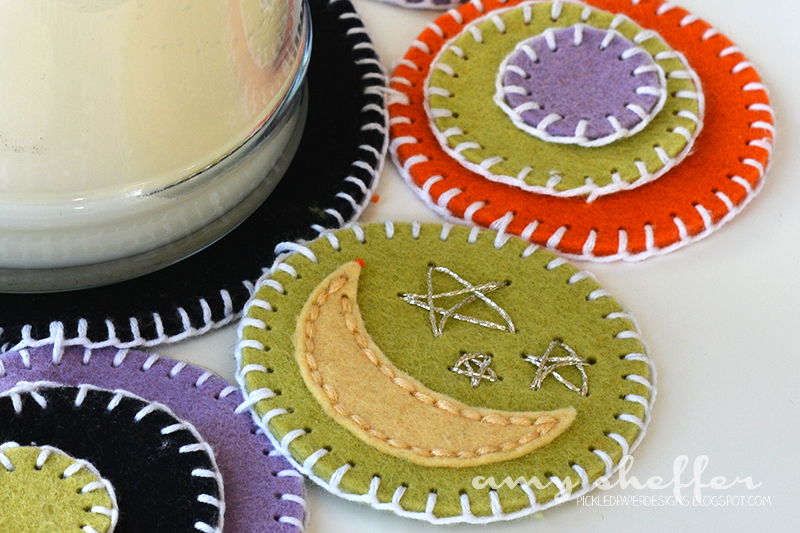 For the center, I used the largest Stitched Circle, which is a great size for candle mats, small plants, a small candy dish, etc. 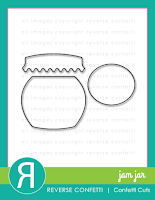 The smaller circles around the perimeter are the third smallest Stitched Circles, I believe. So the basic construction is to rmake a ring of smaller circles around the larger one. 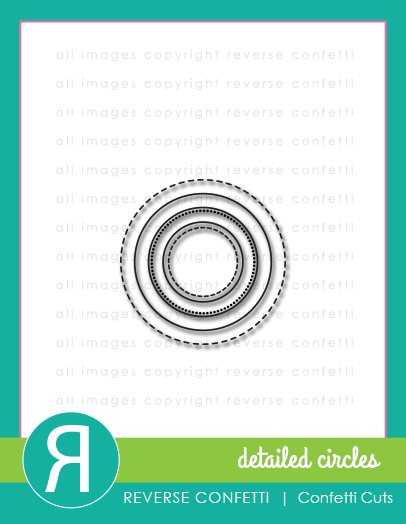 I was able to fit nine smaller circles around the larger one. 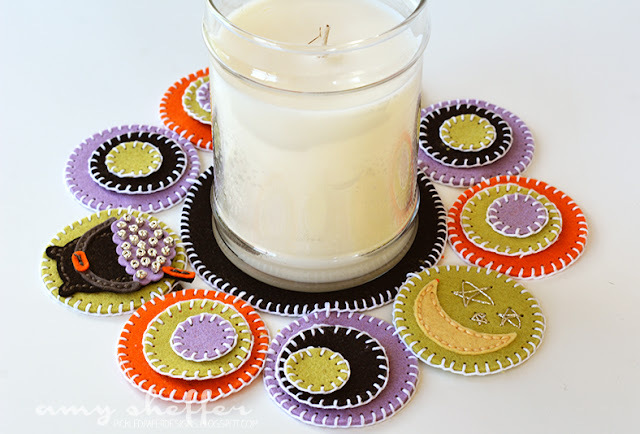 Three of them have themed elements, and the other six are traditional stacked penny circles. I stitched all the individual circles first using a blanket stitch on everything but the shaped die-cuts, then connected the smaller ones to the large one, and last connected the smaller circles to each other. You can see the extra stitches and knots where I stitched the circles to each other. I'm thinking there's probably a different way that hides the stitching better. 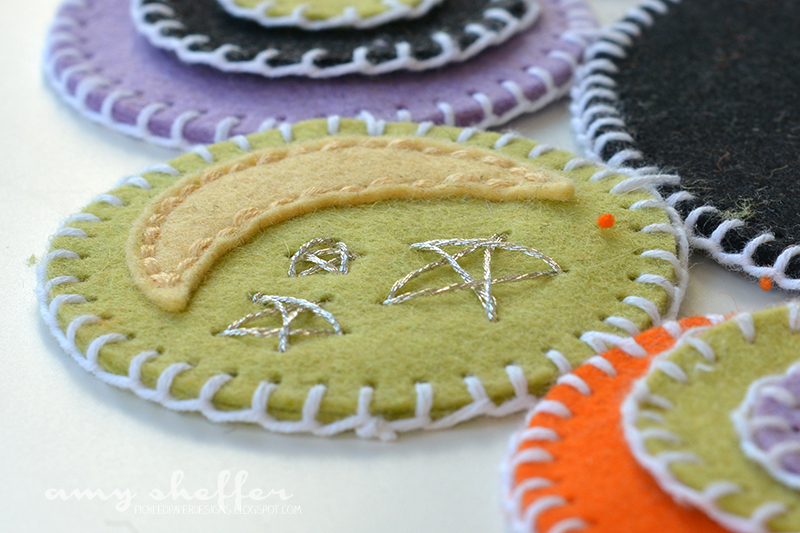 I have a feeling I'm going to be making more of theses, so I'll figure it out next time! Here it is all assembled. Updated to add: I confess one I got everything for this die-cut, I thought it would take me forever to stitch up. But I was pleasantly surprised at how quickly the blanket stitching goes. 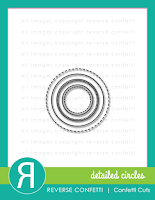 You're only going around the circle once, as opposed to the running stitch, which would require going around once and then reversing to finish. Also, the stitching holes just make everything go faster. I'm telling you, my fingers were flying through these! And look how perfectly spaced the stitches are, thanks to the holes! 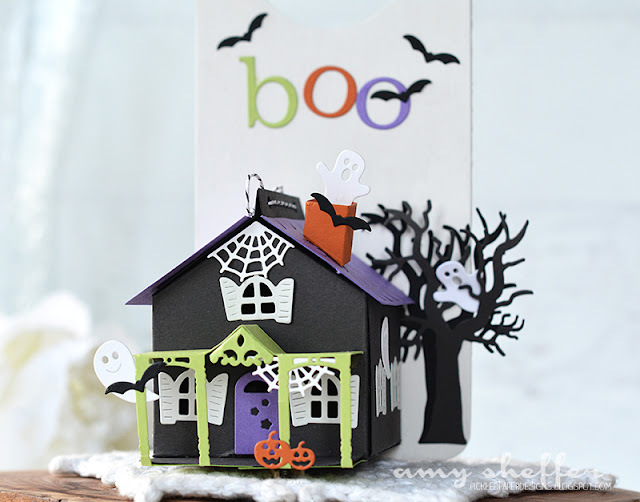 For more Halloween stitching inspiration, visit the Papertrey team. I can't wait to see what everyone came up with! 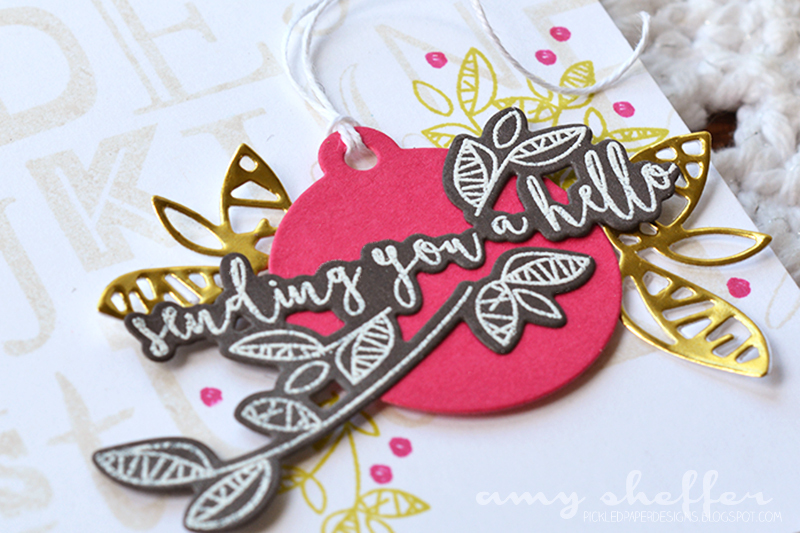 Welcome to Day 4 of Papertrey Ink's August release countdown. 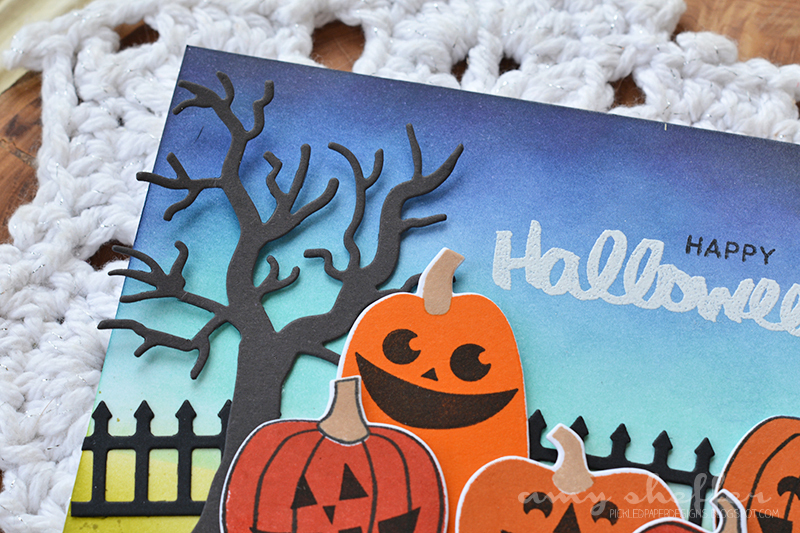 Today is all about Halloween! 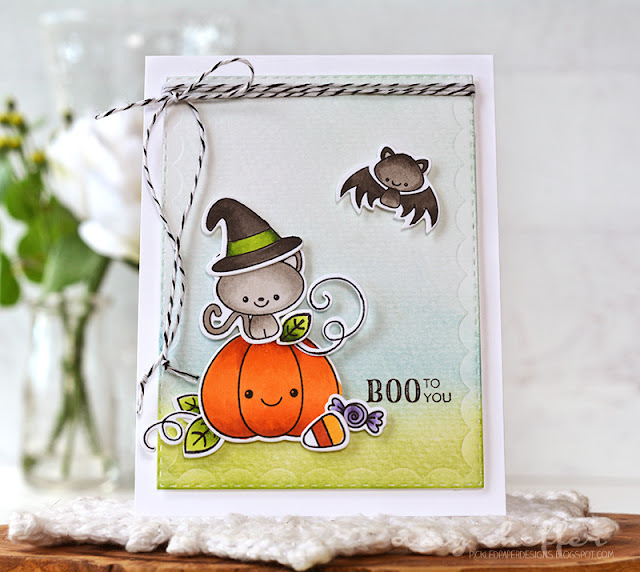 We have some spooky, but absolutely adorable goodies to introduce today: Tiny Town: Spookville by Betsy Veldman, another look at yesterday's Autumn Pumpkins by Heather Nichols, only this time with some added Pumpkin Expressions, and, finally, Shaped Sayings: Halloween by Maile Belles. 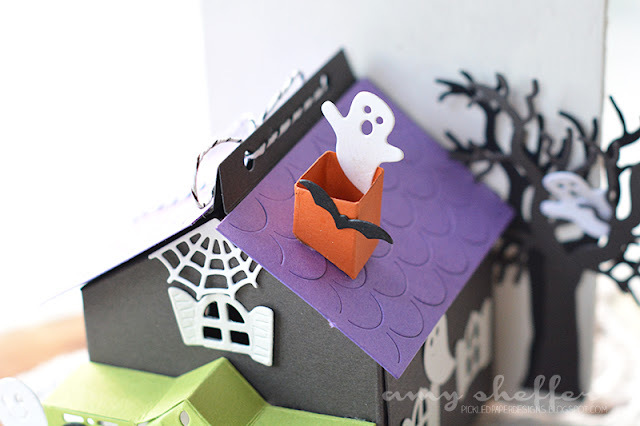 First up is Maile's Shaped Sayings: Halloween. Like the previous Shaped Sayings, the sentiment is in that loose circle shape, but with this set, Maile has also added some additional shapes -- a moon, stars, and bats. 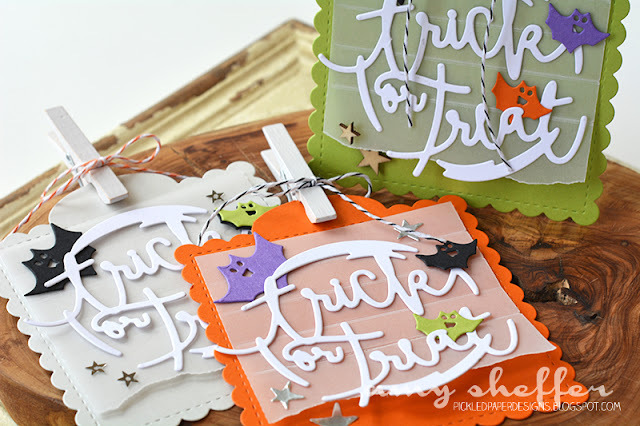 It's one of those die sets that truly makes for some quick, easy projects. My tags all begin with a Tag Sale: Quilted die-cut, topped with some torn and scored vellum. Next I added the die-cut sentiment, then embellished with bats and stars. 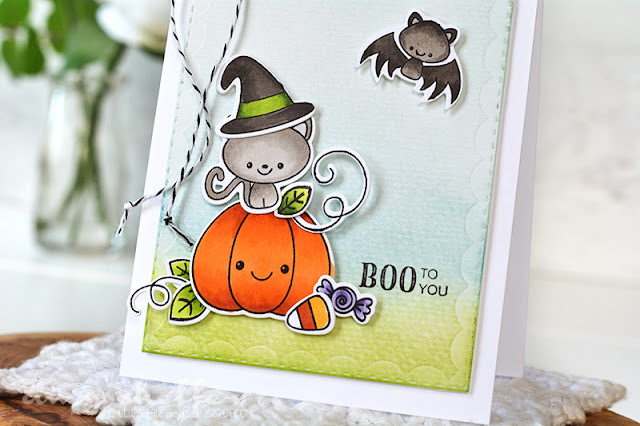 Those bats are the cutest! 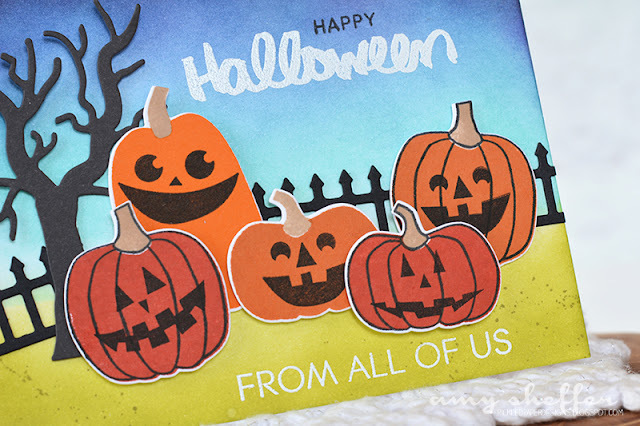 Here's a fun card idea: Halloween wishes from the whole pumpkin family! The pumpkins were done with Autumn Pumpkins and Pumpkin Expressions. I began by ink blending a dramatic sky using green and blue inks. 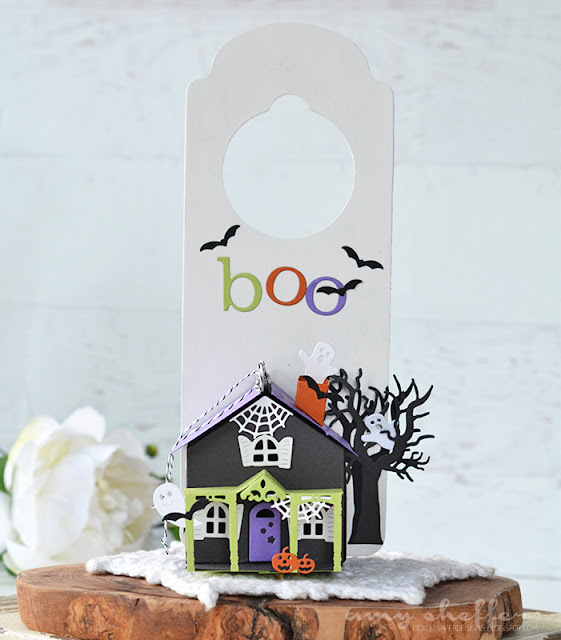 I added a tree and fence, both from Tiny Town: Spooky Yard. 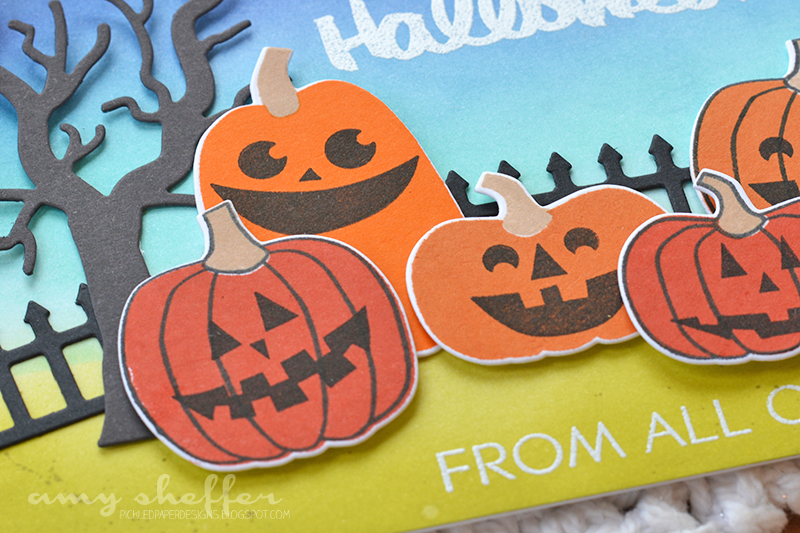 Then I layered the five pumpkins in a grouping to finish the scene. "Halloween" is from the Pumpkin Expressions set. 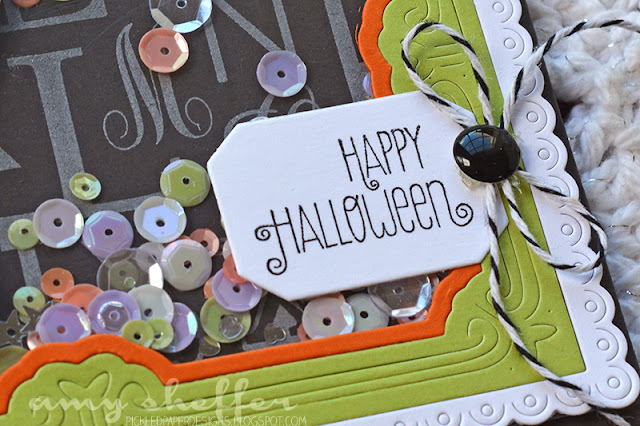 There is a "happy" included in Pumpkin Expressions, but mine went AWOL on my craft table yesterday, so I borrowed this "happy" from another set. "From all of us" is a sentiment in the Keep It Simple: From All Of Us set. And last is the oh-so-adorable Tiny Town: Spookville. I seriously do not know how Betsy comes up with these ideas! The detail dies in this one are amazing! 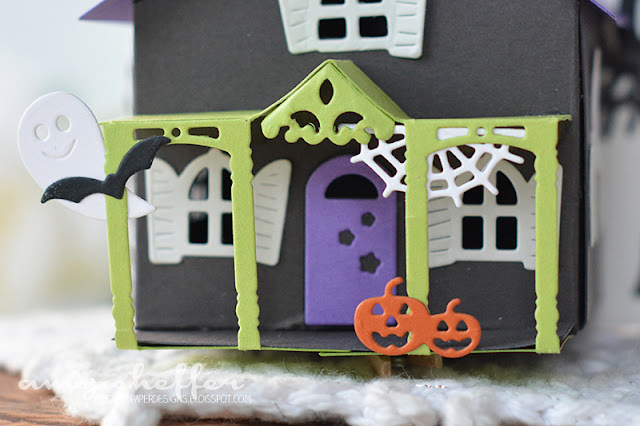 I constructed my little house with a detached roof so that the box could be opened and closed and filled with treats. I then attached the house to a wooden door hanger and added the word "boo" to turn this into one of those "you've been booed" gifts. 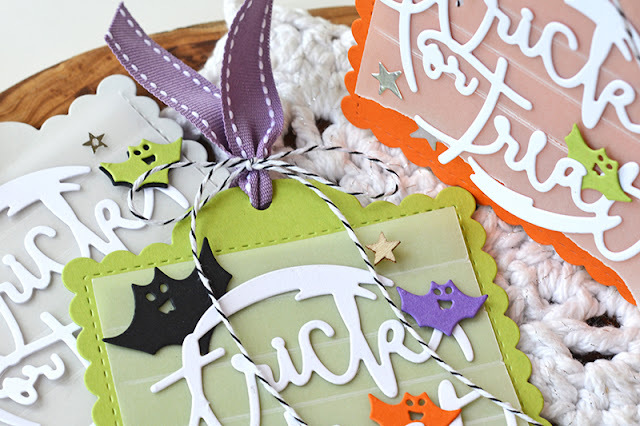 These would be cute to hang on the teachers' doors for Halloween. Or kids rooms, too! A small bag of candy, a stack of Ghirardelli squares, a handful of truffles or other bite-size candy, a good-size handful or two of candy corn would all fit nicely. 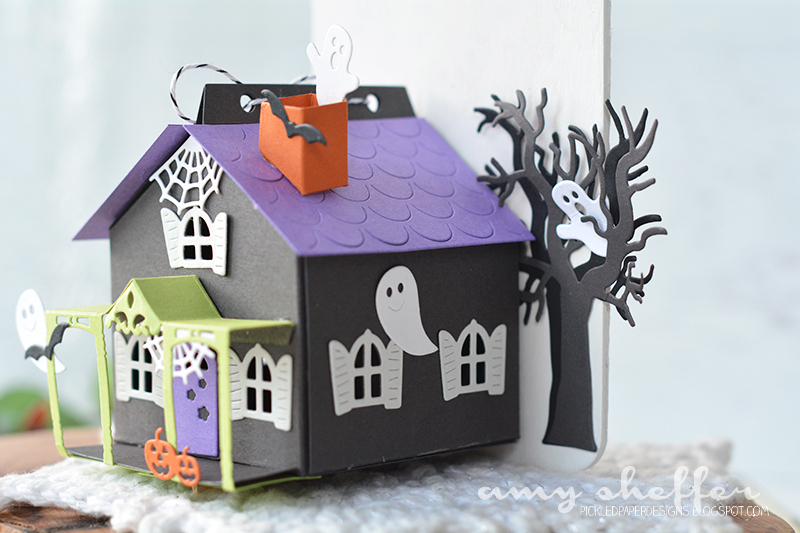 I cut one of the roof top die-cuts in half and adhered to either side of the box's roof, just for some added color. 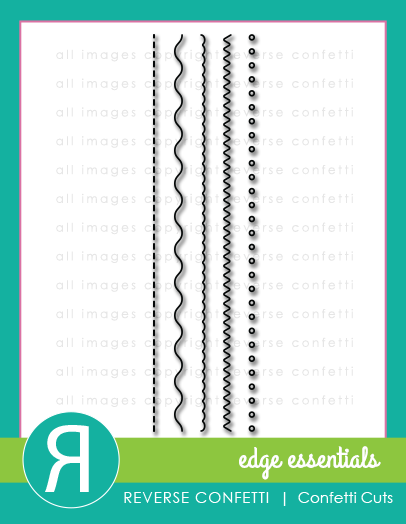 Visit Maile, Erin, and Lexi for more ideas with their new products, too!